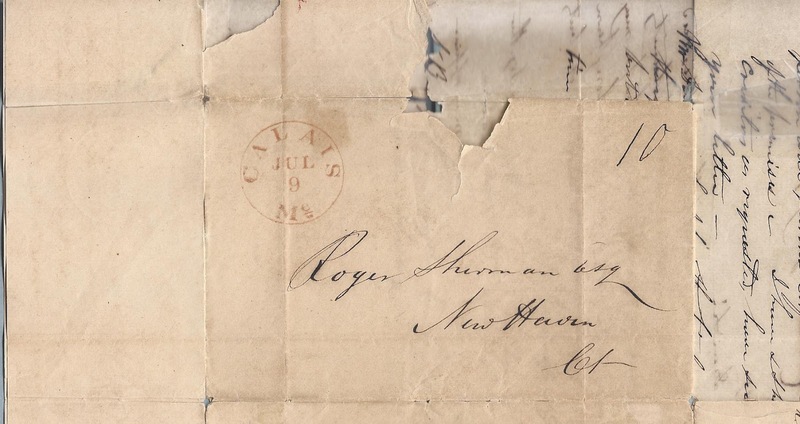 July 7, 1845 letter from Levi Lincoln Lowell of Calais, Maine, to Roger Sherman at New Haven, Connecticut. 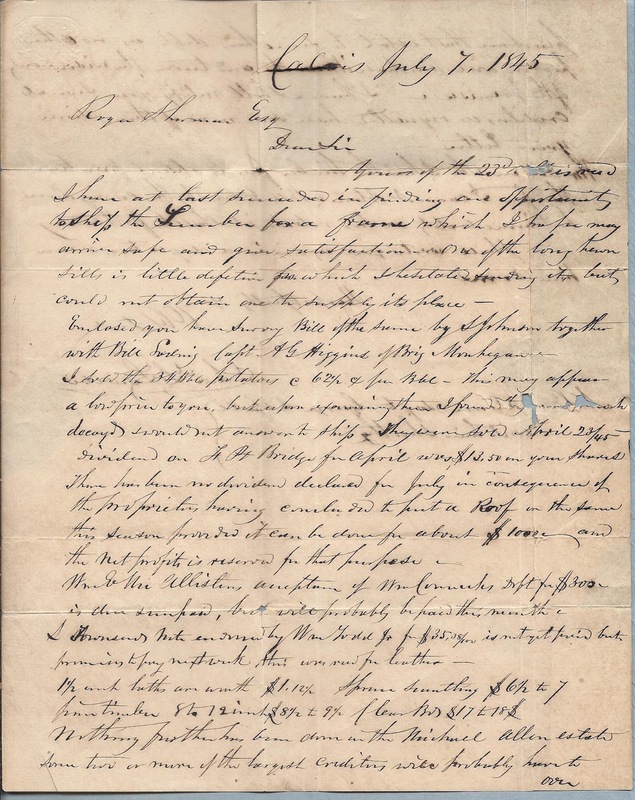 The letter concerns business dealings in lumber, potatoes and dividends from the Ferry Point Bridge that spanned the St. Croix River between Calais and St. Stephen, New Brunswick. Levi Lincoln Lowell was born 11 April 1805 at Wiscasset, Maine, son of Joseph and Lydia (Nason) Lowell. His paternal grandparents were Joseph and Abigail (Danforth) Lowell. His maternal grandparents were Abraham and Anna (Erils) Nason. On 18 December 1832 at Calais, Maine, he married Emeline Mowbray Danford, daughter of Paul and Mary (Cothran) Danford. She was born 30 January 1808 at Wiscasset, Maine. The couple had, I believe, eight children, but most did not survive until adulthood. Levi died in 1880 at Calais; his widow died in 1896, also at Calais. 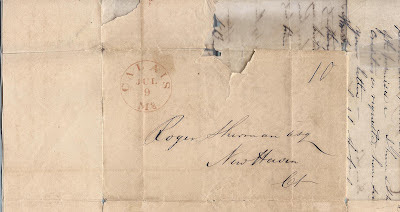 I wonder if Roger Sherman was Roger Sherman, Jr., whose father, Roger Sherman, was the only man to sign all four of the founding documents of the United States. Roger Sherman, Jr., was a merchant and shipper at New Haven, Connecticut, and it was plausible that he would have dealings at Calais, a border port, just upriver from Passamaquoddy Bay. I have at last succeeded in finding an opportunity to ship the Lumber for a frame which I hope may arrive safe and give satisfaction. One of the long hewn sills is little defective for which I hesitate to send it but could not obtain one to supply its place. 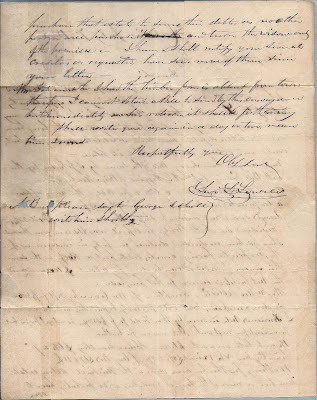 Enclosed you have Survey Bill of the same by S. Johnson together with Bill Lading Capt. A. G. Higgins of the Brig Monhegan. I sold the 34 Bbls potatoes @ 62-1/2 cts per Bbl. This may appear a low price to you, but upon examining them, I found they were much decayed and would not answer to ship. They were sold April 23, 1845. Dividend on F [Ferry] Pt [Point] Bridge for April was $13.50 on your shares. There has been no dividend declared for July in consequence of the proprietors having concluded to put a Roof on the same this season provided it can be done for about $100 - and the net profit is reserved for that purpose. 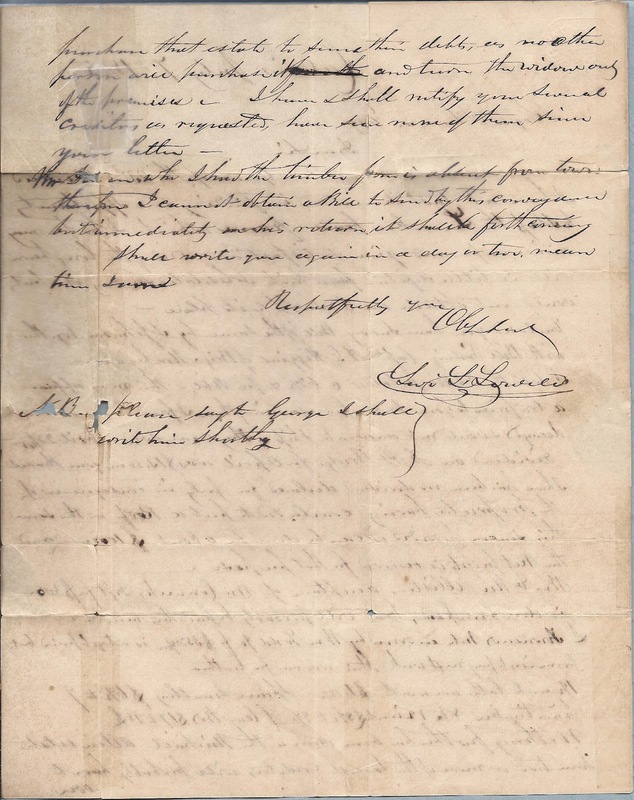 William E. McAllister’s acceptance of Wm. Connick’s draft for $300 is due and unpaid, but will probably be paid this month. 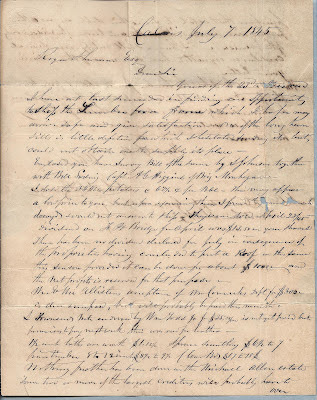 S. Townsend’s note ____ by William Todd Jr. for $35.08 is not yet paid but promises to pay next week. This was _______ - 1-1/2 ___________ [ laths are worth?] $1.12. Spruce ____$6-1/2 to 7, ____[pine?] timber 8 to 12 inch $8-1/2 to 9-1/2. ____ [Floor?] Bds $17 to $18. Nothing further has been done in the Michael Allen estate since two or more of the largest creditors will probably have to purchase that estate to ___ their debts as no other person will purchase it and turn the widow out of the premises. I have and shall notify your several creditors, as requested, have seen none of them since your letter. Mr. ____ who I had the timber from is absent from town. Therefore I cannot obtain a Bill to send by this conveyance but immediately on his return it shall be forthcoming. N.B. Please say to George I shall write him shortly.